The MicroCT is an X-ray Based, non destructive technology which enables 3D computer modeling of objects and their in-depth, precise, quantitative morphological analysis. The technology is based on reconstruction of a large number of 2D X-ray projection images to create a 3D model at extremely high resolution – micronic and even sub-micronic. The MiLabs high-resolution microCT provides exquisite object modeling and versatile analysis of various sample types. Like in other X-ray systems, the imagery is permitted by the semi-permeability of materials to the X-ray beam. The ability of materials to absorb the X-ray energy correlates with their atomic number and density. This correlation allows to differentiate between materials with just differences in molecular composition. This concept is applicable both in material sciences and life sciences. 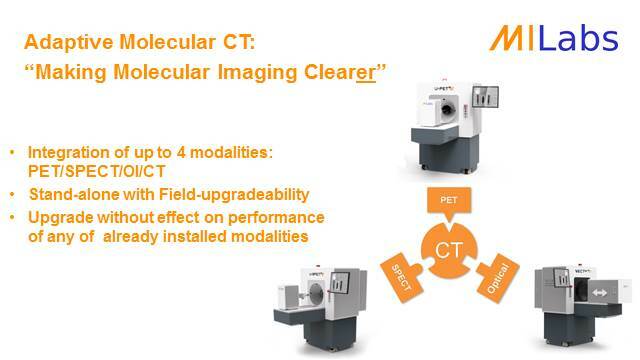 All MILabs preclinical systems are field upgradable: If one starts with U-CT one can add 0.25 mm resolution SPECT, 0.75 mm resolution PET or Bioluminescence/Fluorescence subsystems. This preserves initial investments and expands your research synergistically into new areas such as hybrid/functional imaging. By adding VECTor technology later on, even true simultaneous acquisition of SPECT and PET tracers becomes available.